I MAI* A ROOMFUL OF FURNITURE recently in the style of Charles and Henry Greene, brothers who designed houses and furniture in California in the first decades of this century. 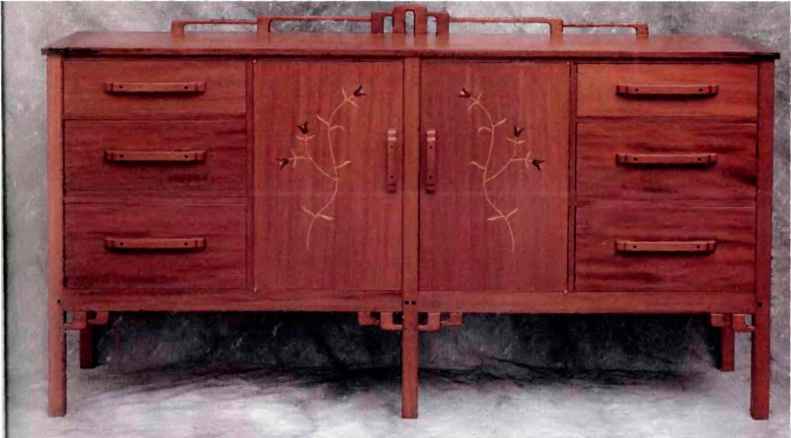 One of the most difficult aspects of making this furniture was finding ways to produce the details, the little touches that define the Greenes' work and make it so appealing to the hand and eye.The square black pegs, which are left slightly proud of the mahogany surface; the exposed splines also proud and gently radiused back to the surrounding wood; the rounded double ! brackets- —these and other signatures of the Greenes' furniture are all deceptively tricky to make well. Once mastered, though, they provide the basic vocabulary for building furniture in the language of Greene and Greene. The Greenes' system of detailing did not develop all at once. It grew gradually as they were exposed to a variety of influences and ideas. 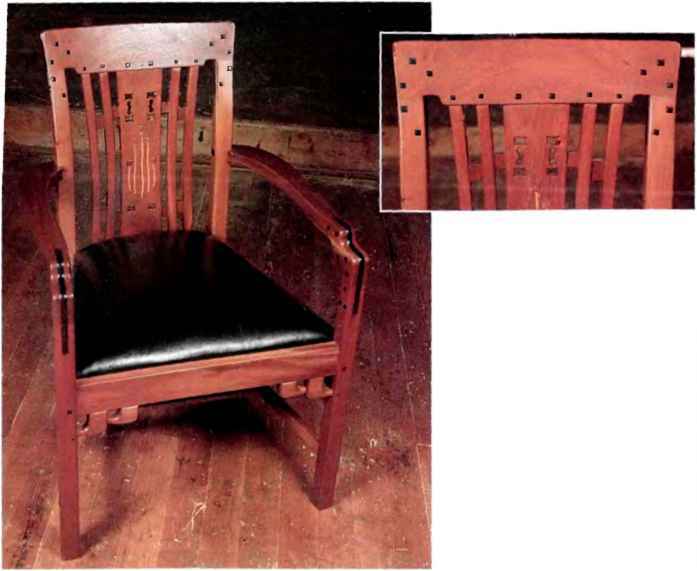 Like many craftsmen of their day, Greene and Greene were deeply influenced by the Arts-and-Crafts movement. Arising in 19th-century Fngland in reaction to the mechanization and shoddy goods of the industrial revolution, the movement was a call for honest hand craftsmanship.The Greenes were particularly influenced by Gustav Stickley and other proponents of Arts and Crafts who emphasized openly expressed joinery and function before frippery— features also evident in all the Greenes'work. gentle curves.There's :m liastern overtone as well in the balanced but slightly asymmetrical patterns of the Greenes' detailing. Die impact of the details in the Greenes' furniture is partly a function ol the materials they used. Combining ebony and mahogany gives the furniture warmth as well as a strong visual contrast. I wanted to achieve the same effects but without using endangered woods. I considered using maple with walnut accents, but I finally chose sustained-yield mahogany and F.bon-X™, an ebony substitute made of chemically altered walnut.The chemical treatment gives the F.bon-X a rich black color but also gives it working properties that aren't that far from ebony's. Square pegs ( Hinting, square ebony pegs are a hallmark of Greene and Greene furni ture.The pegs rise above the mahogany, and each little edge is gently ntdiused back to the surrounding wood, providing a reflective surface and a tactile message of hand craftsmanship.The pegs emphasize the joints in the furniture and many are caps for counterbored screws. Hut as I laid out the mortises for them on the crest rails of the chairs, 1 realized that some of the pegs are purely decorative. 1 followed the Greenes' example in making the pegs in a variety of sizes, from Vu. to V<. in. sq. As far as I could tell, the variation 111 size was a matter of aesthetics. 1 found, too, that their placement was not exactly symmetrical. Rather than being lined up in rows, the pegs were arranged in subsets slightly offset from each other to add visual interest (see the top right photo on p. 22). SWEET DETAILS define the furniture of Greene and Greene. Learning to produce them is key to making furniture that corn-pa res to the originals. The author's sideboard (above) and writing desk (facing page) are fresh designs, but their superbly made and marshalled details give them the ring of the real thing. Both are made of sustained-yield mahogany and Ebon-X, an ebony substitute. TO SUBSTITUTE FOR EBONY, the author used Ebon-X (chemically altered walnut) for black details. REPRODUCING DETAILS-Square black pegs left proud convey the Greenes' message of hand craftsmanship in the author's reproduction chair. 1 made - in.-deep mortises for the dozens of pegs with my hollow-chisel mortiser. h makes the job quick; the little tearout i^ not noticeable after I drive in the slightly oversized peg;. You could also use a drill and chisels or chop the mortises by hand. 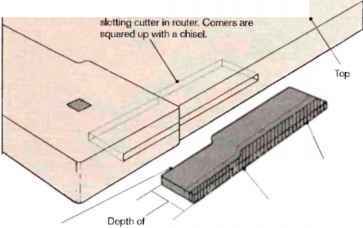 be the exposed surface of the pegs: achieving a totally smooth surface was essential. It would be murder to make the tiny radiused edges with the pegs already in their mortises, so I did my shaping ahead of time. 1 rounded down slightly on each edge at the end of the stick with an orbital sander. keeping the roundovers equal.To get the gleam of polished ebony, I took the sticks to my grinder and burnished the ends with red rouge on a cotton buff wheel. When 1 was satisfied with the finish, 1 bandsawed about X in. off each end of all the sticks and repeated the process until I had a good supply of pegs.The bandsawn face would be hidden in the mortise, so I didn't have to clean it up. But 1 did chamfer the four bottom edges, so they wouldn't hang up or cause tearout when 1 drove the peg into the mortise. I did the chamfering on my stationary belt sander, holding the little pegs by hand (leave your fingernails a little long for this chore). Or you could do the chamfering against a stationary piece of sandpaper on a flat surface. I put a little glue in the mortise and drove the pegs with a rubber mallet. 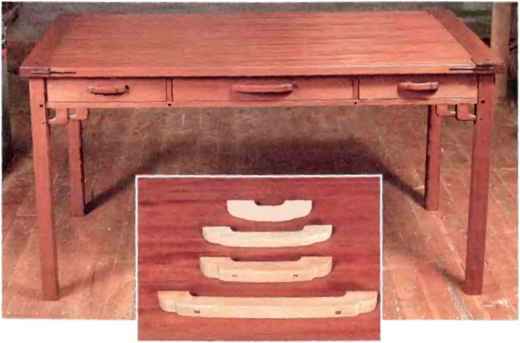 Those little double-L brackets below the seat of the chair and the c ases of the sideboard and writing table are derived from Chinese furniture. In addition to tying parts together visually and adding a curve, they provide some resistance to racking forces (see the top photo). While they may look innocent, they're quite a challenge to make. 1 made the brackets in bunches. 1 made a Masonite® template for each size I. and traced it over and over 011 a board machined to the correct width and thickness. Because the wide end of the I would be face glued, I put it 011 the edge of the board to give it a long grain surface. I cut the brackets out 011 the handsaw and then sand ed their outside curves 011 my stationary disc sander and their inside curves with a sanding drum chucked into my drill press. To be sure 1 had flat, square glue surfaces, I touched them up using the miter gauge with my stationary disc sander. 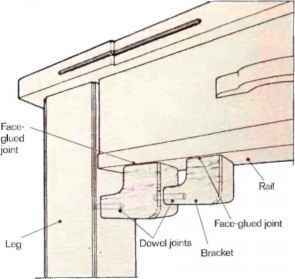 BRACKET ALIGNMENT IS TRICKY The author locates a dowel hole on his table by sliding the bracket along a guide board clamped to the apron and marking with a dowel center. CHINESE BRACKETS FOR STRENGTH and a sinuous line-Drawn from Chinese furniture, curved brackets tie Greene and Greene pieces together visually as well as structurally. What sets the Greenes' work apart is the hi en ding of an Oriental aesthetic with Arts and Crafts. keeping good pressure «11 die lit— tie workpiece. Because the grain changed direction as 1 routed around the bend, I found it was important to go fairly quickly and maintain even pressure. 1 doweled pairs ofl. 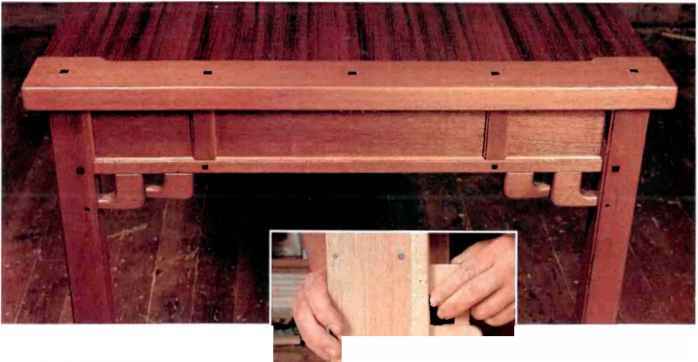 's together and then doweled and face-glued them to the furniture, as shown in figure 1.To drill the dowel holes in the L's, 1 clamped them in my drill-press vise with stop blocks set up to keep them oriented properly as I tightened the vise. Gluing up the brackets was a two-stage operation. First I joined the two I s. 1 laid them 011 the tablesaw (any reliably flat surface will do) and pushed the dowel joint together by hand. 1 found if 1 held them for 30 to 40 seconds, 1 could leave them and they'd stay tight. When they were dry, I gave them a quick hit on the belt sander to make sure the glue surfaces were flat and square. The second stage was gluing the brackets in place.To locate the dowel hole in the leg, 1 put a dowel center in the bracket and slid the bracket along a guide board to mark the spot (see the inset photo 011 p. 23). After I'd drilled the dowel hole, I clamped the bracket 111 place using one small quick-release clamp to pull the dowel joint tight and another to keep pressure 011 the face joint. Exposed splines The arms 011 the chairs I made are joined to the front legs with large-splines shaped 111 a shallow S. Like the square pegs, the splines are left proud of the surrounding wood and gently radiused back to meet it.The sinuous black line of the Ebon-X in the mahogany arm emphasizes the joint and underscores its double curve. I lere the spline is structural, but where a similar element appears in the breadboard ends of the sideboard and writing table, it is purely decorative. EXPOSED SPLINES MASKED Movf mem of solid panels in the Greene's work. But the plywood top (right) won't move. So the spline (facing page) is glued to both the panel and breadboard end. PUU.S CAN MAKE OR BREAK a piece of furniture: Experiment to find the right one by mocking up a range of pulls. the sanding, radiusing, and burnishing on the exposed edges of the splines before screwing and gluing them in place. Breadboard on the sideboard I made the tops of my sideboard and desk breadboard style, as the Greenes did.The breadboard ends are decorative in my piece because I used a veneered plywood panel and didn't have to accommodate seasonal movement. The ends are solid mahogany, biscuited and glued to the panel. At the front, 1 inserted false loose splines of Ebon-X. Because the breadboard ends extend beyond the panel, the splines had to follow in a shallow S-shape, as shown in Figure 2. 1 routed mortises for the splines with a slot cutter fitted with a bearing wheel. Af ter chiseling out the ends of the mortises, 1 cut t.bon-X splines to length and rough-cut their back edges to the shallow S-shape on the bandsaw. I ike the square pegs, the false splines stand proud of the surface, so 1 put them in temporarily and scribed a line following the contour on the edge but spaced away '/ in.Then I removed the splines, and bandsawed to the line. I gently radiused the edges that would be exposed, sanded and burnished them and glued them in place. Pulls If a door or a drawer front could be compared to clothing on a person, then knobs and pulls would be like neckties, pins, and earrings -finishing touches that are key to the overall impact of a piece. 1 used the same type of pull on the table drawers as I made for the sideboard. 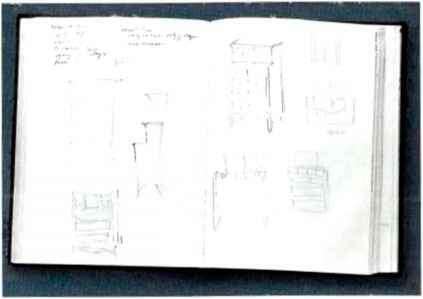 1 tried a number of different sizes before settling on the right one for each piece, as shown in the inset photo on the facing page.The pulls are a variation on the Asian "cloud lift," an abstract representation of clouds found throughout the C ¡reenes' work. I bandsawed the pulls and filed and sanded to finished shape; then I radiused the edges with a router. I had to scale them down considerably from the ones used on the sideboard. For the sideboard, I decorated them with square pegs, but on the smaller pulls for tlie writing desk, I found they looked cramped so I left them off. A fitting finish 1 wanted the pieces 1 made to have an immediate presence, a feeling of having been around for a long time: In a sense, they had been.To achieve it, I treated the wood with potassium dichrornate, an oxidizing agent borrowed from photographic processing. It comes in powder form and is mixed with water and sponged on. Before applying it, I wet-sanded every surface to raise the grain and knock U back down. While applying the potassium dichrornate, 1 kept an air hose handy to dis perse the puddles that formed in the inside corners. If they are left to stand and soak in, the color will be uneven. I then sprayed three coats of catalyzed lacquer, sanding 1«. '-tween coats with 320-grit paper. 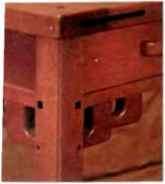 THOMAS HUGH STANGI LAND is a professional furniture maker in Seattle, Wash.
Insert spline into mortise, and scnbe line on spline % in. from edge of top. 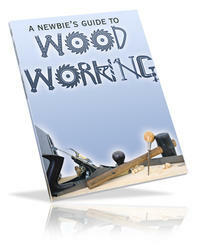 Remove spline and band saw close to scribe line; then smooth with sand ing drum and random-orbit sander.